I'm a big believer in the idea that individuals without a studio behind them can still make exceptional episodic web content. It's been done before, with series like Doomsday Arcade, There Will Be Brawl, Pioneer 1, Adventure Now and most recently, VGHS. Over the past few years, I've seen first hand how the quality of the product doesn't need to be sacrificed because of the limitations of a low/no budget operation. Doomsday Arcade was actually my first exposure to episodic web content with great visual effects, and what inspired me to look into effects as a new hobby. Indeed, the largest barrier to entry is not money, but the drive to create and sustain a high quality product over numerous weeks or months. However, just like in traditional television and feature films, visual effects can never replace solid writing, good acting, and good shooting, (which is why I believe VGHS gets a failing grade, but more on that another time). Yesterday saw the premiere episode one of Sirius Black and the Secret Keeper, a web series created by Adam Villasenor. It came to my attention about a week ago, and to be honest, I was initially a bit skeptical of the product due to the over abundance of self promotion in lieu of actual footage, and the amateurishly designed web site (if you're showcasing a big piece of work, show me that you care enough to professionaly promote it). I don't know, maybe VGHS still left a bad taste in my mouth. Maybe I'm being unreasonably harsh on it. Well, I've watched it twice now, and here are my thoughts. This, of course, begs some explanation. Sirius Black and the Secret Keeper is not a bad price of work by any standards, but it's not a great piece either. The acting is better than most, but not all, web based episodic content that I've seen. Bianca Giselle channels Helena Bonham Carter's Bellatrix Lestrange by way of Buffy the Vampire Slayer's Drusilla, and does a great job of it. Lindsay Kirk's Marlene McKinnon, though making a valiant attempt, seemed to fall just shy of the mark of believable, however that may be because we got so few closeups of her face, and I wasn't able to really connect with the character in what should have been a much more emotionally heavy scene. Due to that lack of connection with the character, I honestly couldn't tell if I believed her performance or not. 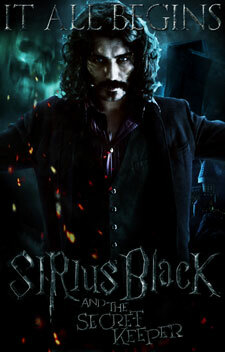 The jury is still out on Reymond Villasenor's Sirius Black. Unlike the remainder of the cast, he's not so much "Oooh" as he is, "...eh". Again, my judgment may be a bit premature, as he only has three lines that I could count in the entirety of the first episode. Aside from the action, I had very little on which to judge him. Speaking of the action, I'm also a bit on the fence. Now, full disclosure, I'm extremely biased by the wand-play of Drew Casson's Venificus Terminus (VT), which was the closest to action of the actual HP movies (and in some cases, surpassed them in quality and choreography). That being said, I liked what I saw, although what I saw was very fast and cramped in some places, and speed-ramped in others. (Note: For those of you who don't know what speed ramping is, think of recent martial arts movies where the action is timed like, fast-fast-fast-fast-sloooooooooooow, fast, fast, sloooooow, rinse, repeat). Speed ramping has been used a lot recently in feature films, and even television, almost to the point where it's getting to be cliche. I like it, but I feel it has to be used sparingly. It was used in VT, but only once during the entire piece if memory serves me correctly. But, if it's your thing, it's your thing, and you'll like how it's used in The Secret Keeper. Other, more noticeable visual effects, weren't bad either, but for the most part, I expected a little more. There's some sky replacement, some day for night, and some stock Optical Flares work in there. Other than that, Villasenor did some fantastic work with costumes, the overall color palette and color grading, an exceptionally good score, and writing better than I originally expected. 1. I'm extremely excited that someone is making an episodic treatment of Harry Potter. It's been a while since we've had the opportunity to find ourselves in that universe, and I'm glad to be back, provided that enough attention is paid to keeping true to the quality of the originals, if not in budget, then at least in writing. 2. The internet seems to be very excited as well, (with almost 50,000 views as of the time of this writing). There will always be a lot of armchair quarterbacks when it comes to the comments section of the YouTube page, but that's to be expected. If anything, this tells me that the is a huge desire for episodic content on the internet, and what better way to jump into it than with Harry Potter? 3. I'm cautiously optimistic about where The Secret Keeper will go. It's apparent that Villasenor cares deeply about the project. (There's actually an extremely touching story about what was going on in the cast's life during production, but you should visit their site for that. I don't think that I could do it justice by trying to explain it here). I'm going to wait and see how this projects turns out in the near future. While my enjoyment barometer may be hovering around +/- 5 right now, rather than a definite enjoy or not enjoy, it's already quite a triumph that this was created at all, and that's something of which the whole Secret Keeper team should be proud. I'd love to tell you when the next episode will be released, but it there doesn't seem to be a definite date. It appears that they're still getting funds together to produce it. If you want to be notified with updates, I suggest you subscribe to their YouTube channel. Here's hoping some of the rest of the website, (namely the blog and bios) get some much needed attention in the near future. I'd very much like to learn more about the cast, crew and what they needed to do in order to produce the piece.